Max LED bulb length from bulb face to end of bi-pin is 2" Direct-Lighting HT-50010-WH cylinder MR16 50W low voltage track lighting provides an excellent source of illumination when a concentrated and precise beam of light is required. This track head is an ideal accent lighting choice for retail store lighting, gallery lighting, display lighting, task lighting, product highlighting, and residential lighting purpose. The color of this fixture is white, the body is made with steel stamping and the transformer located inside the polycarbonate case. The attached 12-Volt electronic transformer can be used with dimmers that support 120v electronic low voltage transformer. The dimension of this track light fixture is 5" max in height and 4" in width. 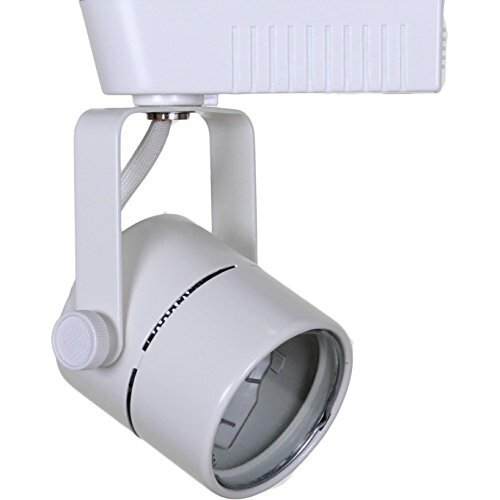 The swivel arms provide 350-Degree horizontal rotation and 90-Degree vertical projection. This light comes with a MR16 lens holder clip that can be used for spread lens, dichotic filter lens, linear spread lens, or honeycomb louver lens (specialty lens and light bulb are not included). This track head works with any typical H system aka 3-wire-1 circuit track system. Max LED bulb length from bulb face to end of bi-pin is 2" If using LED bulb, please do not use dimmer. Integral electronic transformer and MR16 lens holders are included. UL Listed. If you have any questions about this product by Direct-Lighting, contact us by completing and submitting the form below. If you are looking for a specif part number, please include it with your message.